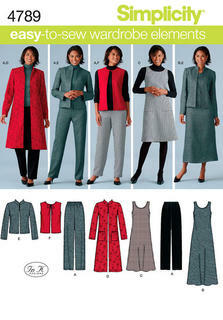 New Zealand's leading supplier of sewing patterns for separates, including blouses, vests, trousers, jackets and more. MISSES' TOP AND SKIRT: Very loose-fitting, pullover top has three-quarter sleeves, bias neck and sleeve binding, contrast band, and high-low hem, wrong side shows. Skirt has elasticized waist, shaped yoke, and lower front and back (squared) with opening. Skirt can be worn two-ways. Purchased shoulder straps. A, B: Very narrow hem. FABRICS: Crepe, Silk Noil, Lightweight Broadcloth, Lightweight Jersey. *With Nap. **Without Nap. Unsuitable for obvious diagonals. NOTIONS: B: 11/4 yds. of 3/4" Elastic, 2 yds. of 5/8" Ribbon, 1/2 yd. of 1/8" Ribbon. MISSES' TUNIC AND PANTS: Very loose-fitting, pullover tunic has bias neck binding, single-layer hem bands, wrong side shows, French seams, and very narrow hems. Semi-fitted, tapered pants have elasticized waist. FABRICS: A: Chiffon, Georgette, Crepe de Chine. B: Silk Noil, Crepe, Linen. *With Nap. **Without Nap. NOTIONS: B: 13/8 yds. of 3/4" Elastic. MISSES' POINTED-HEM TOP, TAPERED PANTS AND BELT Very loose-fitting, pullover top has bias neck binding, short sleeves, contrast right sleeve, and shaped hemline (wrong side may show). A: Continuous bias binding finishes sleeves and hemline. B: Very narrow hems. Semi-fitted, tapered pants have elasticized waist. Belt has applied tie extending into tie ends. FABRICS: A, B, C: 4-Ply Crepe, Charmeuse, Crepe de Chine. Belt: Satin, Shantung. Interfacing: Buckram, Crinoline. Unsuitable for obvious diagonals. NOTIONS: C: 11/4 yds. (1.2 m) of 3/4" (2 cm) Elastic. MISSES' BANDED TUNIC WITH YOKE AND TAPERED PANTS Loose-fitting, pullover tunic has neck and front bands, front and yoke extending into mock-welt pockets, self-lined yoke back, front pleat, long sleeves with stitched hem, button tab, very narrow hem, and concealed button closing. Rolled sleeves and shaped hemline: Wrong side shows. Semi-fitted, lined, tapered pants have shaped waistband, back welt pockets, and fly zipper and hook closure. FABRICS: A: Silk Broadcloth, Linen, Shirting Cotton, Wool Challis. B: Crepe, Gabardine, Wool Flannel. Unsuitable for obvious diagonals. NOTIONS: A: Four 1/2" (1.3 cm) Buttons, Two 5/8" (1.5 cm) Buttons. B: 7" Zipper, One 5/8" (1.5 cm) Button, Two Hook & Eye Closures. MISSES' BATWING OR LAYERED-OVERLAY TOPS, PENCIL SKIRT AND PANTS Loose-fitting pullover tops have side seam slits, topstitching, and three-quarter length sleeves. Reverse side of fabric will show as contrast. A: Front and back yoke extend into sleeves with slits. B: Front and back overlays. Fitted skirt and pant below waist, have back invisible zipper and narrow waist binding. Pants have side-back panel and topstitching. FABRICS: Satin-Back Crepe. Unsuitable for obvious diagonals. NOTIONS: C, D: One 7" (18 cm) Invisible Zipper and One Hook & Eye. 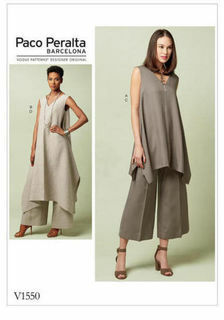 MISSES' DIAGONAL-SEAM TOP AND PLEATED PANTS Loose-fitting top has back invisible zipper closure, shaped front and back side panels, and long sleeves with in-seam invisible zippers. Semi-fitted pants have front pleats, back invisible zipper closure and side pockets. 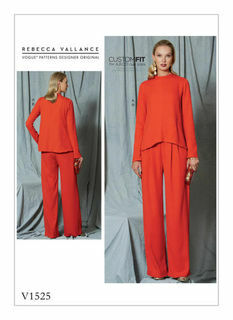 Separate pattern pieces are included for cup sizes A, B, C, D. FABRICS: Crepe, Jersey, Crepe-Back Satin, Rayon Blends. Unsuitable for obvious diagonals. NOTIONS: A: One 7" (18 cm) Invisible Zipper, Two 5" (13 cm) Invisible Zippers. B: One 7" (18 cm) Invisible Zipper. MISSES' ASYMMETRICAL COLLAR JACKET, DROP-SHOULDER SHIRT, AND STRAIGHT-LEG PANTS Fitted jacket has short dolman sleeves and midriff waist insert. Shirt has dropped shoulder and long sleeves with cuff. Pants have front zipper and no waistband. FABRICS: Jacket A, Pants C: Wool Crepe, Wool Flannel, Gabardine. Shirt B: Poplin, Broadcloth, Crepe de Chine. Lining C: Cotton Twill. Unsuitable for obvious diagonals. NOTIONS: A: Three 1" (2.5 cm) Buttons, 11/2 yds. (1.4 m) of Sigle-Fold Bias Tape. B: Eight 5/8" (1.5 cm) Buttons. C: One 7" (18 cm) Zipper, Two Hook & Eyes, 31/2 yds. (3.2 m) of Double-Fold Bias Tape. 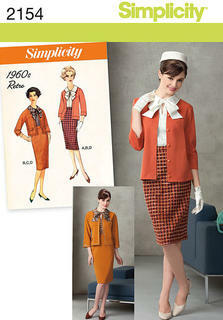 MISSES' SINGLE-BUTTON JACKET, TIE-COLLAR BLOUSE AND CALF-LENGTH SKIRT Semi-fitted lined jacket has princess seams, single-button closure, shawl collar, in-seam pockets, two-piece sleeves, back vent and contrast inset. Loose-fitting blouse has collar extending into tie, back yoke extending into forward shoulder seams and French cuffs. Semi-fitted skirt has back invisible zipper. 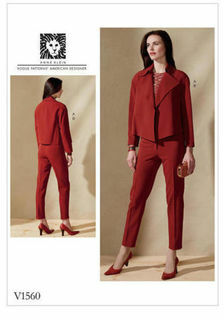 FABRICS: A, C: Gabardine, Wool Crepe. Contrast A: Satin. B: Crepe de Chine, Charmeuse. Unsuitable for obvious diagonals. NOTIONS: A: One 3/8" (1.0 cm) Button, Three 7/8" (2.2 cm) Buttons, One Pair of 1/2" (1.3 cm) Thick Set-In Style Shoulder Pads. B: Eleven 1/2" (1.3 cm) Buttons, One 1/4" (0.6 cm) Button. C: One 9" (23 cm) Invisible Zipper and One Hook & Eye. MISSES' PULLOVER TUNIC WITH UNEVEN HEM AND WIDE-LEG PANTS Semi-fitted, pullover tunic have contrast inset at center front, contrast binding and uneven hemline: wrong side of fabric will show. Loose-fitting pants have no waist band. C: Contrast insets and binding. D: Contrast binding. FABRICS: Linen, Silk Dupioni, Crepe. Contrast: Organza, Charmeuse. Unsuitable for obvious diagonals. NOTIONS: C, D: One 7" (18 cm) Zipper, One Hook & Eye and Seam Binding. MISSES' OPEN, LOOSE JACKET AND SLIM PANTS Very loose-fitting, lined jacket has collar and collar band. Fitted pants have fly front and tapered legs. FABRICS: A, B: Crepe, Wool Flannel, Gabardine. Interfacing: Nylon Fusible Knit. NOTIONS: A: 2 yds. (1.9 m) of 1/8" (0.3 cm) Piping. B: One 7" (18 cm) Zipper, One 1/2" (1.3 cm) Button and Two Hooks & Eyes. MISSES' JACKET, BELT AND SKIRT Semi-fitted jacket has self-belt and contrast upper collar. Close-fitting skirt has elasticized waistband. FABRICS: Unsuitable for obvious diagonals. A: Pique, Eyelet. Contrast A: Organza. B: Laser-Cut Scuba Knit, Stretch Lace. Lining B: Two-way Stretch Knits (50% Cross Grain). Note: Fabric requirement allows for nap, one-way design or shading. Extra fabric may be needed to match design or for shrinkage. Misses' & Plus Size Easy to Sew pullover dress or tunic, pull on pants and knit cardigan in two lengths.